Aljamain Sterling has all the makings of a future star in the UFC Bantamweight Division. Sterling wrestled at the Division III level in college before finding his way to MMA in 2009. He went 6-1 as an amateur before going pro in 2011. Sterling won his first 2 pro fights and quickly moved on to fight for the Ring of Combat Bantamweight Championship. 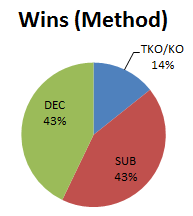 In a close battle, Sterling earned a decision victory over Claudio Ledesma. Sterling never hung around to defend the ROC title though as 1 month later he signed with Cage Fury Fighting Championships (CFFC). Sterling’s CFFC debut could not have gone better as he defeated Evan Chmielski via 1st round TKO to earn a title shot against CFFC Bantamweight Champion Sean Santella. Sterling was able to overpower Santella throughout the fight and cruised to a unanimous decision victory, capturing the CFFC Bantamweight Championship. Sterling has since defended the title twice against Casey Johnson and Sidemar Honorio. In 2013, Sterling was forced to undergo surgery to correct a torn labrum. He should return in the 2nd half of 2013. 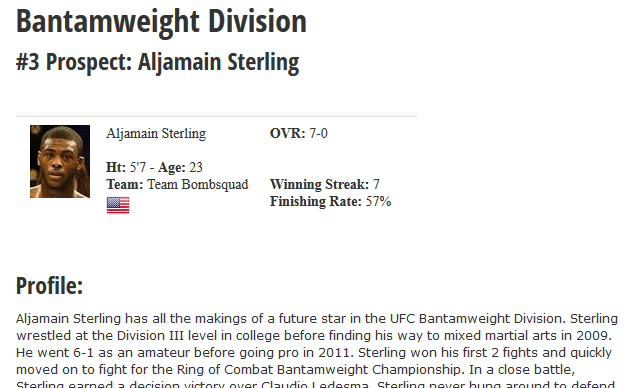 Sterling is based in New York where he trains at Team Bombsquad. His camp is home to UFC veteran Mike Massenzio and Bellator Featherweight Shahublat Shamhaelaev. Team Bombsquad is one of the most respected camps out on the East Coast. They were most famous for being UFC champion Jon Jones’ former team. Sterling is tall and lanky. He wrestled in Junior College. He utilizes a long jab, and is a bit unorthodox with his striking. He has great takedowns with a solid top game. He trains at Team Bombsquad. He grew up in New York…Does this description remind you of anyone? If you said Jon Jones, you were correct. Let me clarify though, Sterling is no Jon Jones. He is still young and developing his overall skill level, while Jones seems to be that once in a lifetime type fighter. Yet, Sterling has a lot of parallels to Jones and I would not surprised to see him utilize his physical tools to one day make a run in the UFC Bantamweight Division. Sterling still has holes in his game. He’s nearly been caught by submissions and also leaves himself open for counters, but these are just small flaws in an otherwise outstanding skill set for a top prospect. Sterling could be a Top 15 UFC Bantamweight if he were to sign with the UFC tomorrow. He’s still flying under the radar because he hasn’t really fought outside of the East Coast regional shows thus far. Depending on when he returns from his recent shoulder surgery, it may only take 2-3 more wins for the UFC or Bellator to come calling.